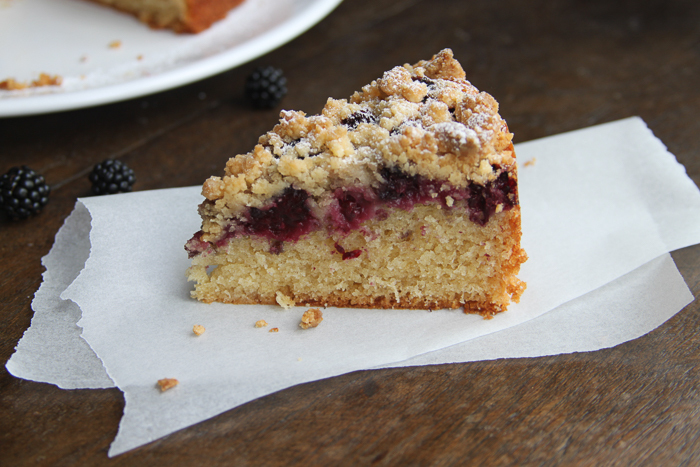 Blackberry Crumble Cake and the child who swallowed a fly…. Once, when blackberry picking as a child, I swallowed a fly. This moment has stayed with me and returns, annually. Every year as I reach for that plump, glistening purple berry I remember the slightly panicked feeling that my eight year old self felt on the realisation that that fly had gone into my mouth and was not coming out. The song about the old lady who swallowed a fly came rushing to mind and I wondered if I would have to follow her lead. What actually happened was that I was encouraged to eat several more blackberries to help the fly down (remember no one walked around with small handy bottles of water in the early 70’s) and then get on with picking. I can’t say I was harmed by this event as apart from my yearly recollection I adore blackberries and certainly wasn’t put off them by the experience. Blackberrying is all part and parcel of autumn and I relish these moments during the year. I’m an enormous fan of seasonal pursuits such as making marmalade when the Seville oranges are in season, elderflower cordial when those lacy white flowers are abundant and of course sloes to make fabulous heady sole gin with and then stash in a dark cupboard, saving for it for Christmas. 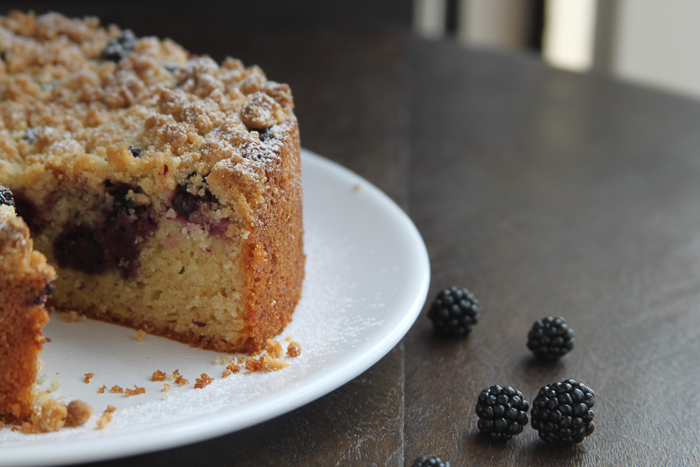 This cake will be ready to enjoy much sooner than sloe gin and is perfect to make with any blackberries you might pick at the weekend. It won’t matter if any of them are squashed by little hands or in my case, by Tom putting his paw on the bag as we drove home. 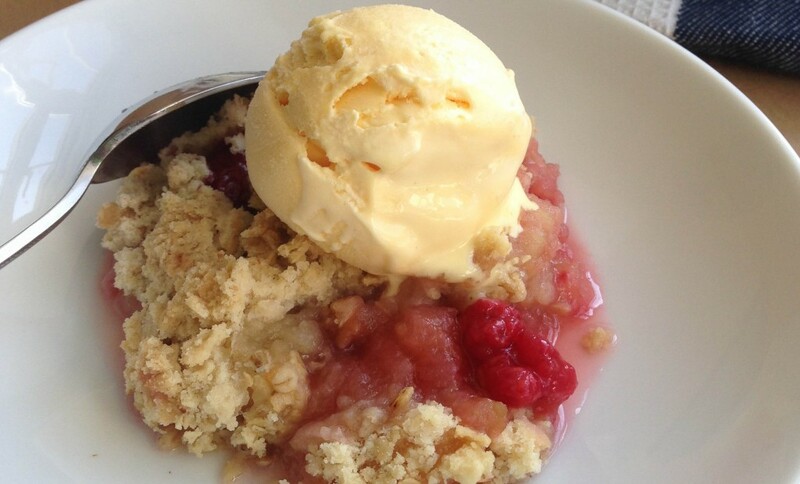 I made this in the summer with blackcurrants and raspberries and it was great, their tangy sharpness a perfect foil to the sweet crumble. Now though I am using blackberries or plums, you could try apples and pears as well. This would also work very well as a pudding with custard or cream (ideally followed by another slice for tea). Preheat the oven to 170 and butter and baseline a 20cm tin. Cream the butter and sugar together until pale and fluffy. Add the eggs one at a time with a little flour each time then sift in the remaining flour and baking powder, add the vanilla, salt and milk and combine. Put the mixture into the tin, smooth the surface and scatter over the blackberries. Melt the butter for the crumble in a small pan mix it with the flour and sugar in a small bowl. Sprinkle this over the blackberries and bake for 50-60 minutes but check after 40 and if the top is browning too much cover with foil. Once it is done, leave in the tin for 20 minutes and then remove from the tin and tuck in if you are serving it warm as a pudding or leave to cool completely. Dust with icing sugar if you want. You may recognise this recipe from last year, I am posting it again partly because it is perfect for this time of year but also because following our house move we still haven’t got any Internet. Back soon with lots of new recipes!